As a rider, you are always looking for ways to improve your seat and use the subtle changes in your balance and pressure to affect your horse. Many improvements come from riding regularly with an experienced trainer but you can also improve your balance, coordination, and flexibility when you aren't in the saddle. The problem - How many times have you been told to, 'put your heels down'? Even experienced riders can overlook this very fundamental rule of riding. Forcing your heels down is not the answer as this causes tension in your legs and knees that will inadvertently transfer to your seat and cause your horse to tighten up his back and lose impulsion. The solution - Your whole leg needs to be relaxed and flexible while riding. To stretch the calf muscles stand on the edge of a step with just the balls of your feet on the step, facing upward. Very gently bounce your body weight a few times to stretch the muscles in your calves. You could build this into a daily workout or do it for a few seconds every now and then when you go upstairs. The results - When your hips, knees, and ankles are relaxed and your calf muscles sufficiently flexible, your heels with naturally hang down slightly lower than your toes. This will allow you to maintain a soft seat and stretch your entire leg, wrapping it softly around the barrel of your horse. The problem - I'm sure your trainer uses the term, 'use your core'. A strong but subtle core is invaluable for slowing and re-balancing your horse. If your core muscles are weak that can result in you feeling heavy and unbalanced to your horse which in turn makes him reluctant to move forward freely. The solution - Using a yoga mat, rug, or carpet, lay flat on the floor. Raise your knees slightly and part your feet. Place your hands behind your head with your palms upright. Contract your ab muscles and slowly raise your upper body until your shoulder blades are no longer touching the mat. 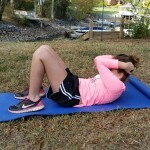 To start with you will probably only be able to do a few but with regularity and practice, you will improve your core strength and gradually be able to add more repetitions. The results - A strong core will help to make you a stronger more confident rider. You will have more control over your position and balance resulting in a safer and more effective seat. The problem - Even though we are told to ride with a soft relaxed leg, we still need to be able to count on our leg muscles to respond within a nanosecond whenever we need them. Weak leg muscles make our leg aids ineffective and also cause unbalance in our seat and upper body. The solution - Stand with your legs slightly apart. Keeping your back straight and your body weight over your feet, slowly bend your knees. You can hold onto the back of a chair if you need support. Go down as far as you feel comfortable. The ultimate goal is to get all the way down into a squatting position but this will come with practice. The results - The extra strength in your legs will allow you to sit quietly but give you the ability to use your leg aid efficiently and effectively. The problem - Weak leg muscles make it difficult to apply sufficient pressure with your leg aids. Squats, as described above, will help but do not cover all your leg muscles. 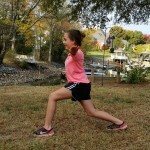 The solution - Lunges exercise the muscles that squats miss. Keep your upper body straight with your shoulders relaxed, tighten your core and step forward with one leg. Lower your hips until both knees are bent. Bring your back leg forward and repeat by stepping with the opposite leg. The results - Well-muscled legs will make it easier to apply leg aids without compromising your seat. The problem - Although most of your hand aids should be subtle you still need to have strength in your arms otherwise your horse could take advantage of you and lean on the bit making him heavy in your hands and on the forehand. The solution - Bicep Curl - Stand with your upper body straight and a weight in each hand at arm's length. Bend your elbows and bring the weights up toward your shoulders. Hold them in position for a couple of seconds before slowly lowering them down again. Tricep Curls - Hold a weight in both hands and lift it above your head. Allow your hands to drop down behind your head until your arms are nearly straight. Bend your elbows allowing the weight to drop further down. 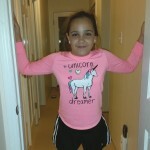 Straighten your arms again and repeat. 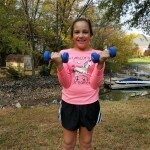 The results - Strong, well-toned arms will make many chores around the barn easier but the will also help with upper-body strength and coordination. This will result in a stronger more confident seat. The problem - Another term that trainers like to use is, 'put your shoulders back'. Unless you walk a catwalk for a living I'm pretty sure you don't walk around with your shoulders back and chest extended. 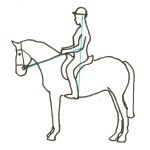 Hunched shoulders, while riding, cause you to tip forward, resulting in your upper body being out of balance with the horse. The solution - Stand in a doorway. Raise your arms out to the sides. Bend your elbows with your palms facing forward. Place the palms of your hands on the door frame and lean slightly forward putting gentle pressure onto your hands. You should feel a stretch in your chest muscles. The results - Relaxed shoulder and an open chest result in a solid upper body position and more pleasing overall appearance. They also help to maintain a level, balanced posture. All exercise routines take repetition and determination to implement but once in place will become part of your normal everyday habits. Consult a doctor before implementing any changes in your exercise routine. Posted in Independent Seat, Influencing a Horse With Your Body, Rider Possition. Tags: balance, balanced seat, dressage, Rider Health on November 13, 2016 by Carol A. Mejia. Riding a horse is so much more than just being able to stay onboard. When I was younger and first learning to ride my friends and I used to joke that once you'd fallen off eleven times you were a perfect rider. In order to achieve this converted title we would slide, rather ungraciously, to the ground at any given opportunity. Of course I now realize there's no such thing as a perfect rider and I'm sure every horse who has ever had a rider on its back can attest to that. But we can aim for improvement, co-ordination, and balance. Until you achieve an independently balanced seat you will be no more than a passenger on the horse. Riding a horse should be a pleasure, for both the horse and the rider. Your ultimate aim, no matter which discipline you ride, is to be mounted on a happy, co-operative horse who is balanced, comfortable, and responsive to your aids. An independent seat is vital in order to maintain position and balance. Once you are able to use each hand and leg independently, without sacrificing your balance and position, you can concern yourself with how your horse is performing. This is when you begin to understand how your body can influence, both positively and negatively, the horse's performance. Only when a rider has developed a deep, balanced, independent seat can they truly influence a horse and either teach it something new or remind it of something it has already learned. Your aids should be clear and accurate enough so that the horse can respond immediately but soft and subtle enough so as not to cause them any stress or anxiety. Your muscle memory should be so finely tuned that your body reacts, almost without you even thinking about it, in a timely and precise manner. This kind of balance and control is not something that can be achieved quickly. It is something we all strive for and some days we get closer than others. To be truly in harmony with your horse and move as one, is one of the best feelings in the world. With patience, empathy, sensitivity, and practice each horse and each ride will get you one step closer to the elusive title of perfect rider. Posted in Independent Seat, Influencing a Horse With Your Body. Tags: balance, balanced seat, influencing a horse on July 18, 2013 by Carol A. Mejia.